As a shepherd, Dairy Month is little more than an excuse to enjoy free icecream at the Market. I’ve been spending my time thinking about lambchops, marketing lambchops and selling lambchops. Hey, I wonder when it will be lambchop month? 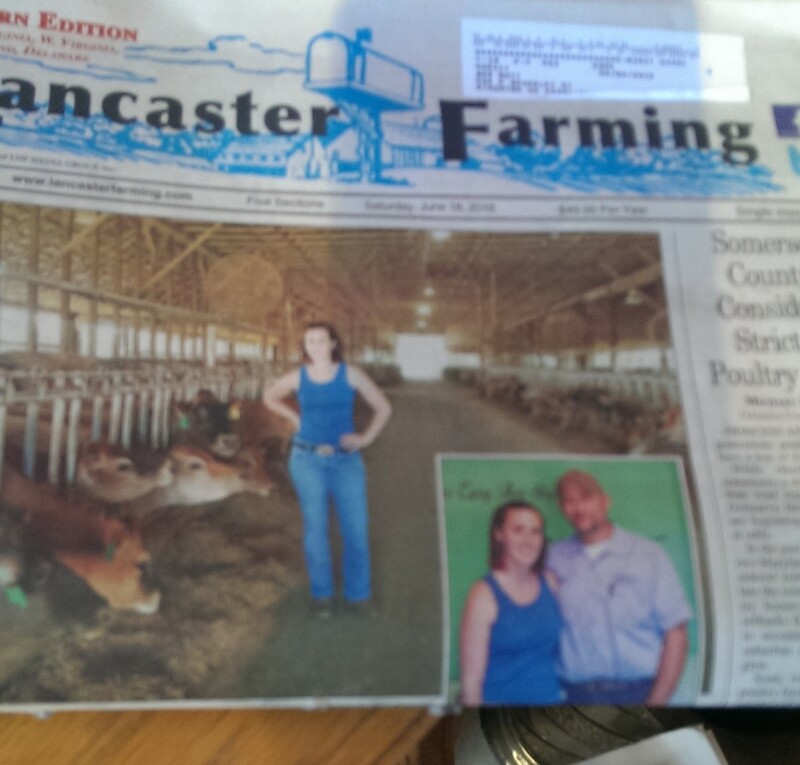 Anyway, Dairy Month had nearly escaped me…until I saw a couple of familiar faces smiling back at me from Lancaster Farming when I was in the feedstore. Yay for the Pyles! It's Dairy Month! How could I forget Dairy month? June has been Dairy month for many years, (since 1937) chosen to heighten the demand for milk and milk products when the lush Spring grasses traditionally brought on the highest yields. It’s been a long time since I wrote a post about Dairy Month. click to read And, it's been even longer since any sort of dairying was a part of my life. It’s been seven summers since we saw our last brown-eyed beauty leave the hill and we said good-bye to home dairying forever. And, I find myself missing those old girls far more often than you may think. Because while we’ve become shepherds…and mighty fine ones (if I do say so myself) I am first and foremost a “cow-person”. Honestly, if I found myself in need of work, I would seriously consider heading to the nearest dairy. 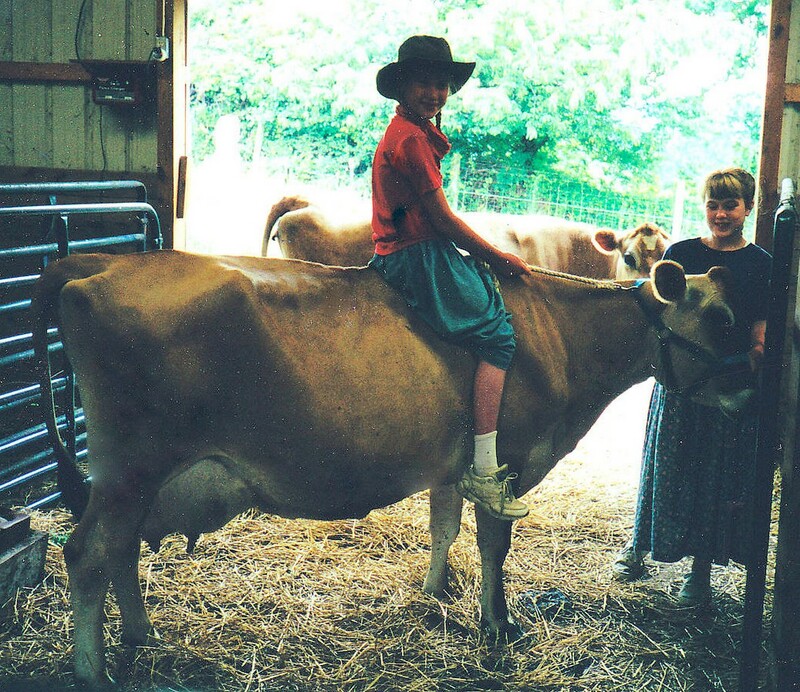 I had dreamed of having a cow ever since I looked deep into a set of Jersey-brown eyes and lost my heart at the county fair when I was just a little girl. My ever indulgent husband saw to the fulfillment of that dream when we found ourselves on the hill. It’s safe to say dairy cows changed my life. Some of our best stories are because we had dairy cows. How many people can say they had Massai sing to their milk cows? This post doesn’t do that experience justice. We met some of our favorite folks ever due to those milk cows. Shout out to Doc Snowdy, Dr. CJ and Sam, among others. Here's a funny farm story. We had more than a few adventures, some tear-jerking moments, great conversations and amazing icecream. This post is the short version of our dairying adventures. 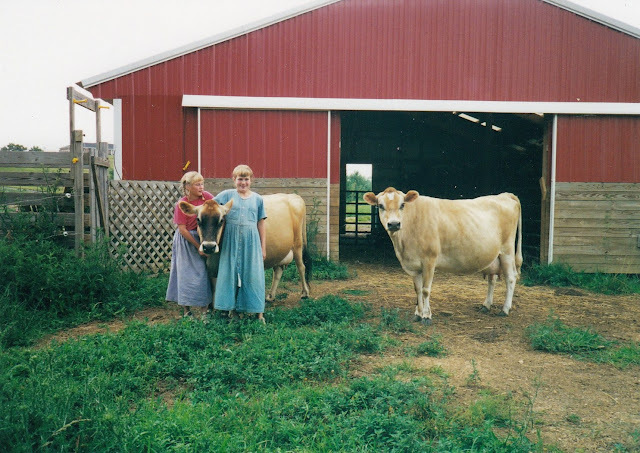 Living/farming on twelve acres of hill and rock, in a state that doesn’t allow raw milk sales…a home milk-cow is not at all a profitable (or wise) venture. The land is too small and not truly suitable for cattle and we cannot produce our own hay and feed. (I know there are folks that have cow shares and/or sell “pet milk” to get around regulations…those options weren’t for me) It was time to move on. We sold the last cow and began to focus our complete attention on the sheep. In the ten years we had our cows, I learned more than you can ever imagine…about breeding, animal husbandry and milk products. I worried and fussed more than you might think humanly possible, mainly about breeding, animal husbandry and milk products. I realized during that time that honestly home dairying just cannot pay its way on an operation of our size. When you figure in the feed and vet bills…I’m guessing that each gallon of milk was worth about $50. (I may be exaggerating) We lost SO much money on that venture, it wasn’t even funny. Definitely NOT a sustainable practice. And, I gained a whole new appreciation for those in the dairy industry. But, I did love those cows! Those dairy farmers who produce the milk, cheese, butter and icecream for the rest of us, REALLY, REALLY deserve some positive recognition. It’s the most demanding type of farming out there. You can’t simply turn off the supply…it’s twice a day commitment EVERY DAY. (and some dairies milk THREE times a day) Dairy farmers catch a whole lot of negative publicity needlessly. Milk prices are at an all-time low for dairies around the world. And, while I can’t do much about that…I can say THANK YOU…and keep buying milk, cheese and of course, icecream. And, be sure to point out that…Dairy farmers rock! Now, back to thinking about national lambchop month…wonder who I lobby about that one? It’s that time of year when a status update of “the same old, same old” would probably be sufficient. I can assure you I am not kidding. Do you get those Facebook memory things? It’s called On This Day…and every time I take the time to read one, it is always uncanny how very similar it is to the present. And, if you review the history of this blog (back to 2009) it’s pretty much on constant repeat, too. While I do indeed find it somewhat comforting, it certainly creates a challenge for writing new and interesting copy about the farm. So, you’ll have to bear with me as I try to come up with something other than “ditto”. The week started off with a family get-together in the Draft. Toughchick made supper for the rest of us in a combo-celebration of Fathers’ Day and the Man’s birthday. There was also cake and icecream and lots of baby snuggles. I can’t believe how our family has grown! Monday afternoon we did indeed head to Edinburg to pick up the first installment of the 2016 lambchop crop. The freezer is well stocked once more. Some customers had been requesting L’il Links since Opening Day! Li’l Links are indeed lamb sausage…seasoned with traditional breakfast link seasoning. YUM! …and oddly, enough, lamb sausage is what got us going in the retail lamb business nearly 10 years ago. 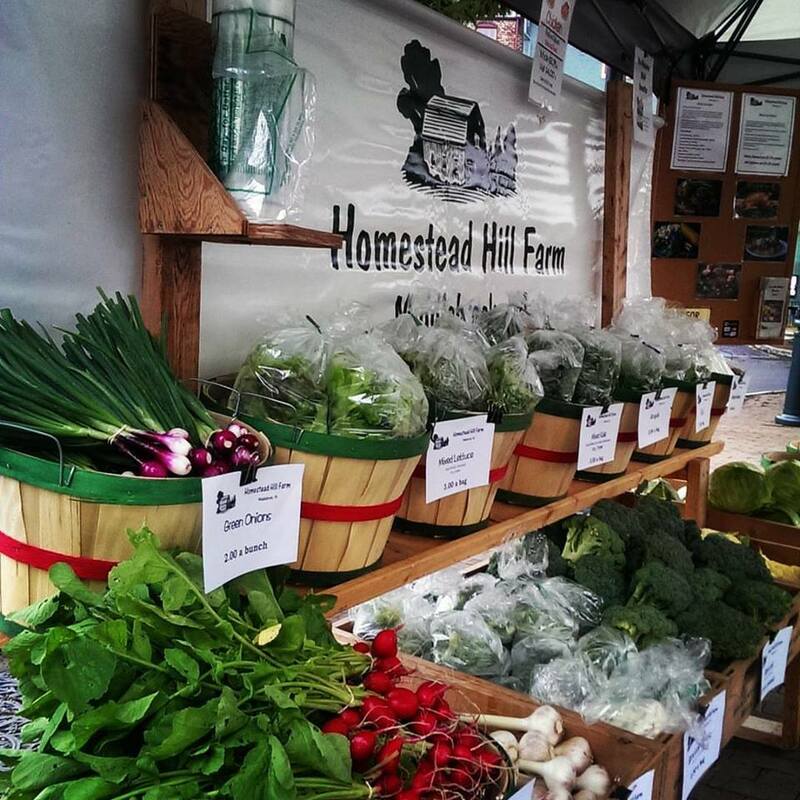 Speaking of variety on our plates…this is the time of year that our “foodie” selves live for. It’s difficult to say just what we like best. Every night we have some new seasonal delight. Honestly, THIS is why we farm. It’s certainly not money or notoriety…it is quite simply…THE FOOD. Which is a good thing, because very few farmers ever attain huge financial success or any sort of fame. look at all the seedlings! When I finished that, the Boss and I spent a couple of hours processing the leftovers from last week’s Market for Winter Sales. In short order, we had trimmed, blanched and frozen more than 75 pounds of broccoli. This will go a long way toward feeding us (and our customers) and providing some much needed cash-flow during the off-season from the Market. See what I mean about thinking ahead? With the threat of thunderstorms every day, and two entire days of rain, it’s safe to say that our outdoor activities were greatly impacted. that gave us a chance to work in the hoophouses, which were in desperate need of re-planting. The Boss did some pulling and tilling and I did some planting. (yep, back to “same old, same old”) While things are looking neater, there is still a lot of work to do. And, the spinach is just NOT cooperating…the constantly changing weather caused the early plantings to bolt and slowed germination of the succession plantings. But, currently, there are hundreds, if not thousands of tiny seedlings coming up in the greenhouse and we received the order for the winter crop just yesterday. We will have spinach again, soon! the freezer is full of lambCHOPS! The constant threat of thunderstorms brought a new concern. No, not storm damage. Gus control. Gus has developed a complete and debilitating fear of thunder. (apparently this is common in male Pyrs…our first dog, Jed, would attempt to run in the house and hide behind the couch!) so, every time we went outside, there was Gus, clinging to us. He tried to open the back gate in order to stay with us when we went to the hoophouse. He hid out in the shop if he could get in the door. He even followed me INSIDE the cooler! Needless to say, we’re all hoping for better weather this week. The storms did indeed cause real troubles in the surrounding area. Parts of West Virginia have been devastated by the flooding and many lives have been lost. https://www.washingtonpost.com/national/23-dead-in-west-virginia-floods-search-and-rescue-continues/2016/06/24/ebdb28ce-3a7e-11e6-af02-1df55f0c77ff_story.html It’s just awful. 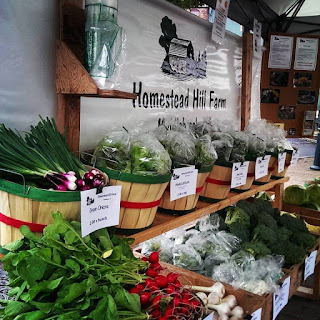 But, the weather didn’t seem to impact customer flow at the Market. It was incredibly busy and I’m pretty sure we could have sold a WHOLE lot more potatoes. However, the rain meant the garden was too soggy for the tractor, so the Boss dug all the potatoes by hand. Slogging through the mud on his knees precluded a major harvest. Yet another reason to hope for a drier week. Then there was the message from the hay guy that started, “Tom…I got a real nice load of hay in the barn…” So, you can guess where we are headed, again! And, the Boss had a message from Angus’ home farm that said, “the ewe lambs are sheared…you can come look…” That means another fieldtrip of sorts. Yippee! I’d much rather go livestock “shopping” than go to the mall. Thanks for stopping by. Come “visit” again real soon. Oh, wait...We did have a unique event this week. 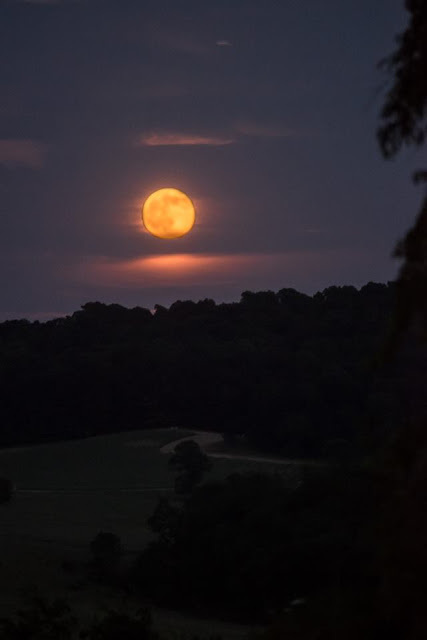 The full moon appeared on the Summer Solstice. This won't happen again until 2094! Here is the Boss' shot of the Strawberry moon. I must say that events of this week have left me (not to mention the rest of the world) shocked, saddened and disheartened. The actions and reactions of people both at home and abroad have been unfathomable. However, I’m pretty sure you don’t check in with the happenings of the hill to hear me philosophize about world events…or my own personal “issues”. The week on the hill was...well, a Summer week on the hill. It was busy, it was hot, it was productive and it was successful. And, I’m quite happy it’s behind us. Monday morning was broiler processing day for June. Now, I don’t know how many batches of broilers we have done over the years. There have been a lot. We’ve got this thing down-pat. It’s almost like some sort of dance where we each know our part and we go through the motions with little debate and discussion. We can get the entire job (from chicken catching to yard cleanup) done in a couple of hours. It’s definitely not the most pleasant of jobs here on the hill, but it is a necessary one if we want to eat and sell chicken. All was going well. The chickens were caught, the processing shed was tidied and ready to go. We headed in for breakfast. When the Boss headed back out the door, he found that it was a good thing it wasn’t a long breakfast break. The hydrostat in the scalder had shorted out and flames were travelling up the side, melting the insulation and licking around the edges of the plywood top. He quickly put out the fire (too bad I missed that shot) and had started to assess the damage before I even walked out the backdoor. not the way to start processing day! Thankfully, the Boss is SO handy and can fix so many things. He was able to rewire and get us back on track without a trip to town or a huge delay. YAY for the Boss! Later, Tbone, Blondie and Mr. B came over for supper. As we talked and ate, I thought I heard a lot of commotion from the lamb paddock. But, the conversation required my full attention, so I did not head out to check (like I usually do). After the kids headed back home, I went out to check gates and secure things for the night. The lambs seemed particularly jumpy and noisy, requiring further investigation. The first thing I do whenever there is an “issue” with the lambs is to count heads. We were missing a fair number, so I headed out to hunt for them. Before I could get to the paddock, I noticed that the electro-net gate was opened. No. It wasn’t opened. It wasn’t even there. It was complete gone. That couldn’t be good! It also meant that the missing lambs could be anywhere on the front half of the farm. I really didn’t feel like a hike down the front hill after a long day. But, thankfully, I could see lambs further down the hill in the tall grass. When I called they came. But, we were still missing one. But, what in the world? Somehow, one ewe lamb had gotten hung up in the electo-net and was now wearing the gate. It was indeed a sight to behold! She was thoroughly tangled in the wire, it was cutting into her wool and hobbling her. She couldn’t even stand upright. And, of course, this was terrifying to all the other lambs who would shriek in terror and run off when she would get anywhere close to them. And, as a flock animal, she needed to be with them. This explained the commotion during suppertime. Since she still had a gate post attached to her electro-net ensemble, I was able to grab that and subdue her so that I could use my Leatherman and cut all the netting off her. She was none the worse for wear after her adventure. But, we will be needing a new gate! Last year’s crop was a dismal failure. I think we harvested something like 25 pounds. The weeds and bugs were beyond description. Really. It was horribly depressing and the Boss finally just bush-hogged the whole thing because we couldn’t stand looking at it. This year is a completely different story! By Thursday we had harvested nearly 300#! And, there is much more. Wowee! On Wednesday, the Boss decided to tackle a critical job that neither of us was looking forward to…getting Angus shorn. I can’t imagine that ram shearing ranks as anyone’s favorite farm job. Rams are big and strong and somewhat unpredictable.…the wool is greasy and smelly. And, Angus in particular has been known to have an “attitude problem”. But, he behaved himself in an exemplary manner. He was shorn without incident. He even had his hooves clipped, de-wormer and vaccine administered. And he is handsome! It is amazing how he filled out in the past year. Just six weeks until he joins the ewe flock to work on the lamb chop crop of 2017! The rest of the week was more of the same old, same old. The Boss harvested the garlic, we planted some more, weeded some, seeded some and put up cauliflower for Winter Sales. The beans and squash are blooming. The Boss cleaned out the brooder and the next batch of chicks arrived. Thursday evening, we were in for a big storm. After our experience with the Derecho, I get concerned any time I hear the term “straight line winds”. There is little you can do to prepare for such a storm and nothing you can to do avoid it. 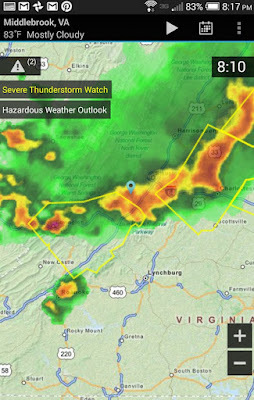 So, you worry and pray…and watch the radar on your phone. The pictures of the lightning and double rainbow north of here were really cool, but, the reports of hail, downed trees and power outages were not. We were thankful for the rain (nearly an inch) and the fact that all the wild weather split in half as it came over North Mountain and we avoided any damage. Definitely something to be a part of "thankful Thursday". Market day was gorgeous. The air was clear and cool. The customers were in a buying mood and the music was lively. It was a great day. One of our customer-friends brought us a box of his hand-crafted chocolates as a gift. They are the most beautiful candies I have ever seen and I don’t know if I can bring myself to eat them. They are truly works of art. You can check them out here. I think we should try to convince him to become an addition to the Market!